By identifying the source of the thoughts that cross our minds and and rejecting those that come from the evil one, we can have more peace and joy. Also, in doing so, we will be happier with our selves and be “'... the true worshipers [that] will worship the Father in spirit and truth; for the Father is seeking such to worship Him'“ as Jesus said in John 4:23. Many people are not happy to be alone by themselves and constantly need background noise (like TV, radio, etc...), because they try to avoid their own thoughts. It is so important, that after being truly born again, that we be renewed in our minds, by learning God's ways to think and handle life so that we can continue to live for Christ. (You may read more on the subject, at click here: "Renewing the Mind." Hezekiah's father, King Ahaz, in order to please one of the kings of Assyria, forsook the Lord and completely violated and desecrated the holy temple of God, including making an offering for himself, abandoning the holy altar for one he had made, and completely disregarding God's priestly system. He even removed the gold and gave it to the Assyrian king. He was so evil, that he brought one of his sons as a living sacrifice to a foreign god (2 Kings 16:1-19). Thankfully, Hezekiah did not follow in the footsteps of his father. 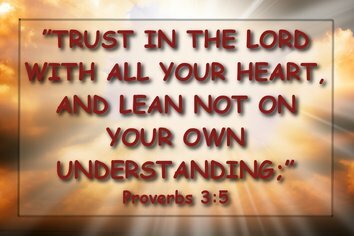 There are so many verses that urge us to “trust in God” and that it is “up to us” to do so. You may read them at click on this article: “Trust In The Lord And Never Give Up – Bible Verses."